This article is about the college basketball arena. For the college football stadium, see Cameron Stadium. The building originally included seating for 8,800, though standing room was sufficient to ensure that 9,500 could fit in on a particularly busy day. Then, as now, Duke students were allocated a large number of the seats, including those in the lower sections directly alongside the court. Renovations in 1987–1988 removed the standing room areas, added an electronic scoreboard and display over center court, wood paneling, brass railings and student seats, bringing capacity to 9,314, though now there is sufficient standing room to ensure 10,000 could fit. For high profile games, students are known to pack in as many as 1,600 into the student sections, designed for a maximum of 1,100. Prior to the 2002–2003 basketball season, air conditioning units were installed in Cameron for the first time as a response to health and odor concerns for players and fans alike. Prior to the 2008–09 season, a new video scoreboard replaced the electronic board over center court. Before the 2009–10 season, additional changes were made, including installing LED ribbon boards to the front of the press table and painting the upper seats Duke blue. The students and fans are known as "Cameron Crazies" for their support of the team and loud cheering that has been recorded as high as 121.3 dB, which is louder than a power saw at 3 feet or a jackhammer. For access to major games, including those against the University of North Carolina, students reside in tents for months in an area outside of Cameron known as "Krzyzewskiville". The hardwood floor was dedicated and renamed Coach K Court in November 2000. Sports Illustrated ranked it fourth on its list of the top 20 sporting venues of the 20th century, and USA Today referred to it as "the toughest road game in the ACC." Additionally, the facility hosted the Southern Conference men's basketball tournament from 1947 to 1950 and the MEAC Men's Basketball Tournament in 1972 and 1973. Duke is 179-12 (.937) at home since the 2004–05 season, second only to Allen Fieldhouse in winning percentage at home. On December 18, 2018, the Duke men's team extended its non-conference home winning streak to 146 games with a 101–50 victory over the Princeton Tigers. This streak is the longest active non-conference home winning streak in college basketball, with Duke's last non-conference home loss coming against St. John’s on February 26, 2000, when the then #2 Blue Devils lost 83–82. The streak is the longest non-conference home win streak in Duke men's basketball history, breaking the previous record, which lasted 95 games, from February 2, 1983 to December 2, 1995, beginning with a 73–71 win over William & Mary and ending with a 65–75 loss to Illinois. ^ King, William E. (March 1, 1996). "Edmund M. Cameron 1902-1988". The Duke Dialogue. Retrieved March 6, 2008. ^ The Encyclopedia of Duke Basketball. Roth, John. Duke University Press. 2006. ^ Lewis, Julia (July 29, 2002). "'Cool' To Be A Duke Fan? Cameron Indoor Stadium To Get AC". WRAL. Raleigh. Retrieved March 6, 2008. ^ "'Duke University Video Display Photo'". ^ "Cameron Indoor Stadium Receives Enhancements". Duke Sports Information. September 13, 2009. Retrieved September 13, 2009. ^ Wolf, Benjamin A. "Decible Meter Picture from February 9, 2011 Game Against the University of North Carolina". Retrieved March 23, 2018. ^ Keohane, Nannerl O. (November 20, 2000). "MEMORANDUM: Summary of Activities" (PDF). Retrieved March 6, 2008. ^ "SI's Top 20 Venues of the 20th Century". Sports Illustrated. June 2, 1999. Retrieved February 19, 2013. ^ a b c "Duke Blue Devils Basketball Statistical Database—Season by Season". StatsGeek.com. Retrieved May 13, 2015. ^ "Cameron Indoor Records" (PDF). Duke Sports Information. Archived from the original (PDF) on September 30, 2007. Retrieved March 6, 2008. ^ "1982-83 Season and Results". 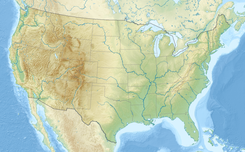 StatsGeek.com. Retrieved March 6, 2008. 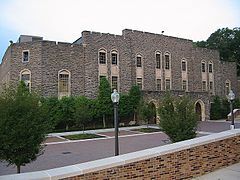 Wikimedia Commons has media related to Cameron Indoor Stadium.